This professional garden hose nozzle adjusts from gentle spray to high-pressure stream in one smooth move to ensure maximum water pressure and flow wherever you want it most. 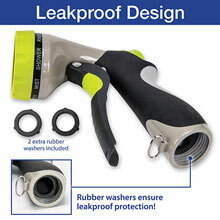 Durable, solid metal construction with a rubberized easy-grip ergonomic handle this spray nozzle resists damage, rust and leakage. 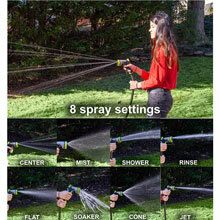 Easy twist head to select 1 of 8 spray pattern and features a lock in place loop for extended watering. 4½" wide, 2" deep, 6½" high. 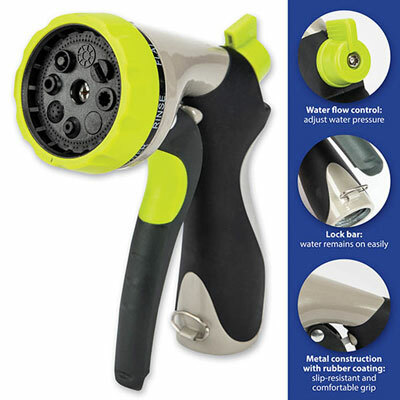 •UNIVERSAL FIT: Fits all standard garden hoses and comes with a quick release adapter for additional fits, perfect for watering you garden, grass, lawn and flower beds. 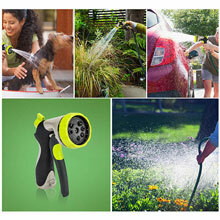 Also makes washing your car, dog or pet a breeze. 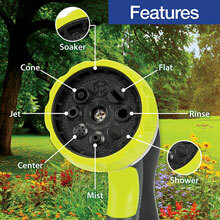 •8 WATERING PATTERNS: For every watering need, weather you need the high pressure jet to clean a hard surface or the soft shower to wash the dog, these 8 patterns have you covered; cone, jet, mist, center shower, rinse, flat and soaker. 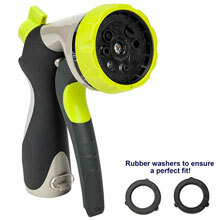 •SOFT RUBBER COMFORT GRIP: Means comfortable spraying, the soft rubber coating makes this nozzle very comfortable in your hand so you can water for long periods of time. 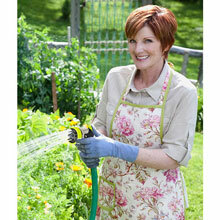 •HEAVY DUTY AND DURABLE: Solid metal construction with baked enamel finish. 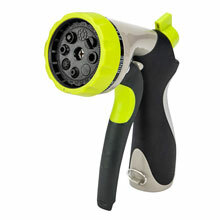 This nozzle is designed to last, this sprayer not only looks polished but is robust and much stronger than plastic water nozzles, the baked enamel gives it a strong durable finish that looks attractive and prevents rust. 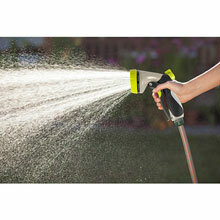 •LABOR SAVING DESIGN: This garden nozzle features a nice lock bar at the bottom of the handle that keep the water remains on without you having to apply any pressure. Just use the clip so you don't have to keep your hand holding it the whole time.